Salt Lake City unveiled two initiatives Tuesday aimed at spurring more construction of affordable housing. 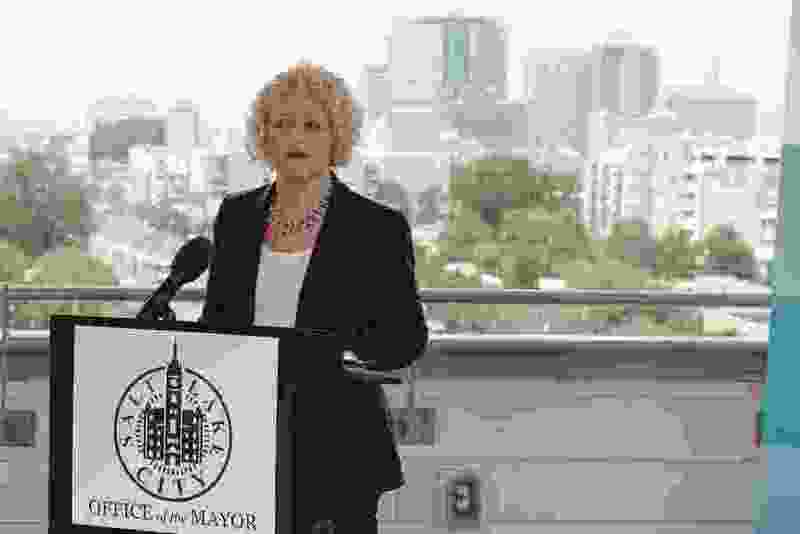 Mayor Jackie Biskupski said she would asked the City Council to expand fee waivers for developers seeking to build mixed-income residential projects — if they set aside at least 20 percent of dwellings for low- to moderate-income tenants. Biskupski also wants to strengthen city policy aimed at preserving existing affordable housing by requiring that dwellings be replaced when they are demolished, removed or converted to other uses. So far, Biskupski said, the city’s multipronged approach is paying off. In an interview, the mayor said the city expected to add at least 2,000 new units by the end of 2019. (Francisco Kjolseth | The Salt Lake Tribune) Melissa Jensen, director of Housing and Neighborhood Development, left, joins Mayor Jackie Biskupski to review accomplishments of Salt Lake City's housing plan, GrowingSLC, and to announce two new proposals intended to incentivize the inclusion of affordable housing in multi-income projects and to preserve existing housing stock. The announcement took place on the rooftop of Liberty Blvd Apartments at 455 S. 700 East in Salt Lake on Tuesday, Aug. 21, 2018. The new development with 266 units has 20 percent affordable housing for $560-$733 in studio, one- and two-bedroom apartment configurations. 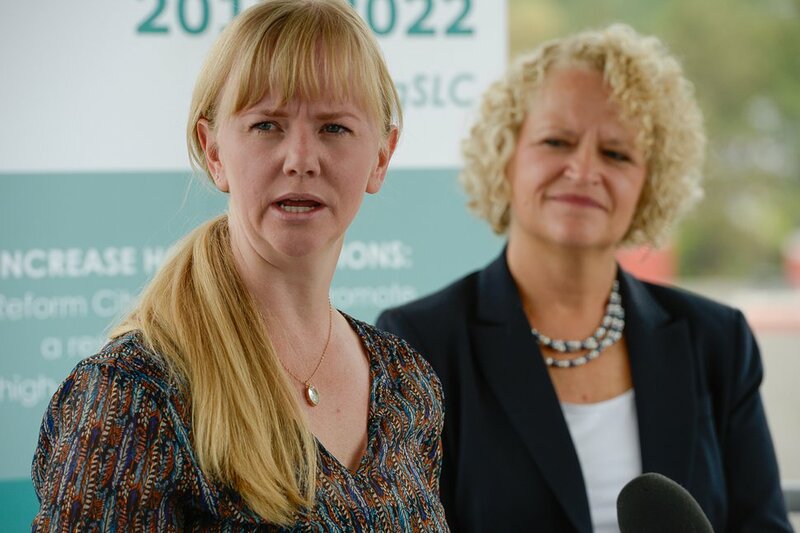 Her announcement comes as housing advocates are calling for stepped-up government action to widen access to affordable homes as rising housing prices and rents in Utah continue to squeeze out some residents and contribute to homelessness. 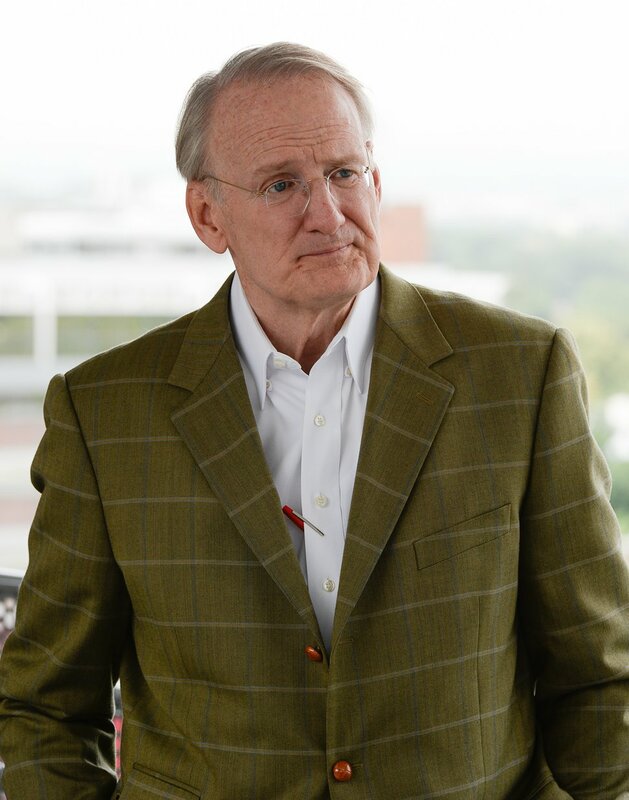 Some have labeled current housing market conditions “a crisis.” Recent research estimates that Utah has a housing gap of at least 43,500 dwellings and that as many as 100,000 households are paying 50 percent or more of their income on housing costs. “You can talk to anyone today and they will have a story of their struggle,” said Melissa Jensen, director of the city’s housing and neighborhood development programs. 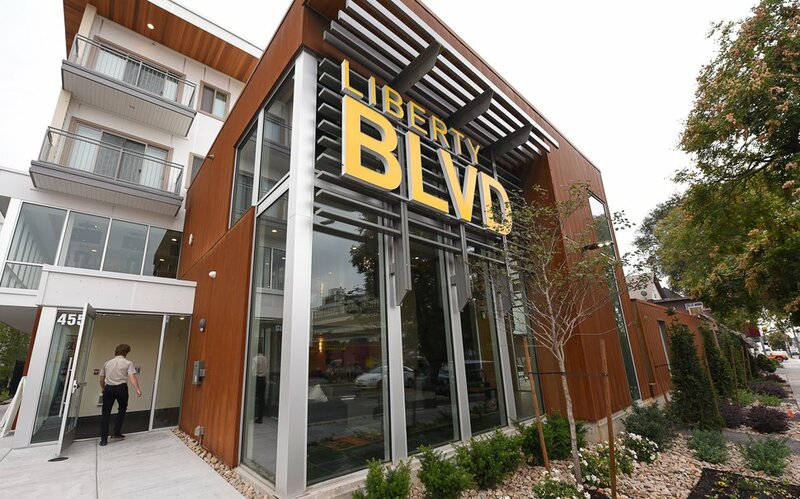 (Francisco Kjolseth | The Salt Lake Tribune) Liberty Blvd Apartments at 455 S. 700 East in Salt Lake is a new development with 266 units that has 20 percent affordable housing available for $560-$733 in studio and one- and two-bedroom apartment configurations. The apartment building was used by city officials as a backdrop to announce new proposals to incentivize the inclusion of affordable housing in multi-income projects and to preserve existing housing stock. In Biskupski’s presentation Tuesday on the rooftop of Liberty Blvd Apartments, a new complex at 400 South and 700 East, she and other officials praised the city’s recent devotion of a stream of sales tax money to boosting affordable housing. Liberty Blvd is a 266-unit apartment project completed earlier this year, with 54 units rent-subsidized and set aside for those earning below median wages. 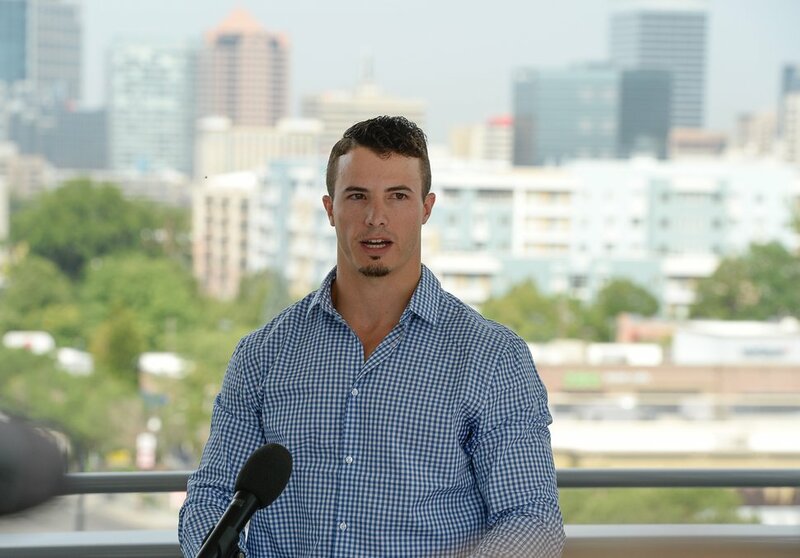 Park City native Conner Prescott said he and girlfriend Hannah Peterson were unable to locate a rental in Salt Lake City that matched their modest budget, until they heard about Liberty Blvd. (Francisco Kjolseth | The Salt Lake Tribune) Conner Prescott, a tenant of Liberty Blvd apartments in Salt Lake City, talks about the benefits of affordable housing as he and his girlfriend begin to build their life together. Mayor Jackie Biskupski gathered with others on the balcony of the new development on Tuesday, Aug. 21, 2018, to announce two new proposals intended to incentivize the inclusion of affordable housing in multi-income projects and to preserve existing housing stock. Developer Dan Lofgren with Cowboy Partners, the Utah-based developer that built Liberty Blvd, said the project benefited from recent zoning changes along TRAX lines, including 400 South and North Temple. Among other steps, the transit zoning created incentives for building affordable housing by giving developers expedited city approval and fee discounts of project plans as long as they follow certain design standards and include affordable units. (Francisco Kjolseth | The Salt Lake Tribune) Developer Dan Lofgren with Cowboy Partners joins Mayor Jackie Biskupski to announce two new proposals intended to incentivize the inclusion of affordable housing in multi-income projects and to preserve existing housing stock. The announcement took place on the rooftop of Liberty Blvd Apartments at 455 S. 700 East in Salt Lake on Tuesday, Aug. 21, 2018. The new development with 266 units has 20 percent affordable housing for $560-$733 in studio, one- and two-bedroom apartment configurations. Jensen, with the city housing department, also praised the city’s creation of a community land trust to keep some homes affordable in perpetuity, as well as a new renovation program to subsidize repairs on aging rental housing to keep it in use.